Export Standard Safety Package or As request. This pedestal stand is made of 100% quality acrylic, widely used in the trade fair, museum, wedding party or any occassions to show or put a particular product, trophy, jewelry, collectibles or memorabilia. This acrylic pedestals with its outstanding shinning look attracts people's quick attention and have a comfortable height for visitors to view products or put anything you want. 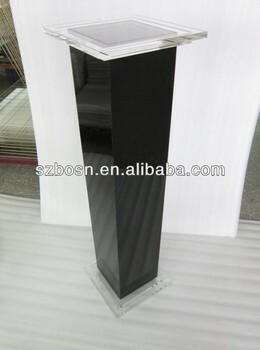 It's also called perspex pedestal stand, plexiglass, lucite. Here please view some of the artworks that we have done for several clients, who're from various walks of life, such as individual photographers, traders, wholesalers or other associations that use the acrylic pedestals to display their products very often. As the society is wheeling, many people live a healthier and richer life. They want to make their house more elgant and different. So the acrylic pedestals is here to come out, with its shinning & crystal luxury looks, and its masters put some flowers or plants on the top of them, will decorate their houses and feel like they live in a pure wild nature. Large Market in the EUROPE and MIDDLE EAST. *This type is with assembly aquirement as to save more space for shipping and cost. 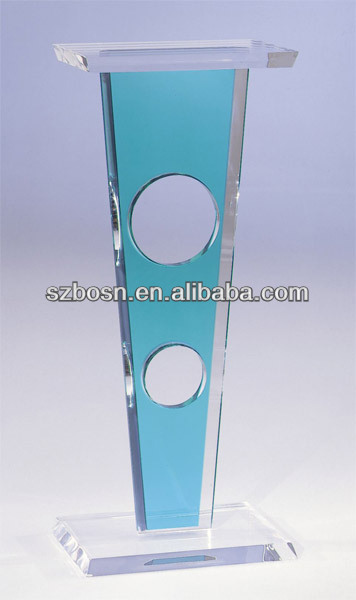 This type of acrylic pedestal stand is made of 30 mm and 10 mm thick acrylic material. it does not need too much work for you to assemble. Yes, It's a non-assemble unit. Certainly you can add some light into it to light the the products on the pedestal when it's dark. Package: Whole unit packed in a carton or honeycomb carton to make sure its max safety. Hey, I have to this is the most popular type of acrylic pedestals welcomed by museums. Why? Firstly, it has a perfect height for them to display their valuable collectibles, throphies, memorabilia. Second, with a clear protective acrylic case on the top of the acrylic pedestal, it will help prevent dust. Last, with light balls inside when it's displayed at night, WOW, it's out of this world. Wonderful & Fantastic!! This pedestal can be designed as your consideration and preferences. With lock to prevent stealing, no problem. With led light decoration or LOGO printing or etching, no problem. In regards to the package, it can be designed with non-assemble or with assembly required unit. Colorful acrylic pedestal with complex manufacturing process to create a luxury look artwork. This requires lots of money if buying quantity is not big, be cautious to purchase. It will paint your house more lively. Thanks for watching the 5 basic types of the acrylic pedestals in the market. Perhaps, you may have seen some different types elsewhere. But it's ok for us to help make them too. Cause we're a professional acrylic displays & fixture manufacturer for many years. All you need to do is show us the photos & drafts and purchasing quantity with specifications. We're sure to offer you a good price and create the best things more than you expect.